Part 2 – of – Quotes from Daniel Nettle’s excellent chapter “The Wheel of Fire and the Mating Game” in `Evolution, Literature, Film: A Reader’ (2010). Including: the Comedy/Tragedy matrix. 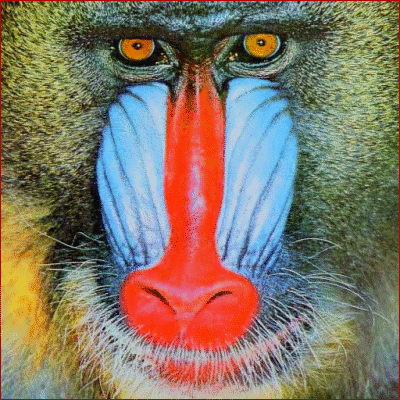 Part 2 – of – Quotes from Daniel Nettle’s excellent chapter “The Wheel of Fire and the Mating Game” in Evolution, Literature, Film: A Reader (2010). `The dramatic mode is perhaps the dominant mode of fictional representation in Western culture. This was not always the case. As Aristotle argues in Chapter 4 of the Poetics, the dramatic mode was developed in the fifth and fourth centuries B.C.E. in Greece, when the epic (story-telling) mode of performance was expanded to include more actors, who directly represented interactions in dialogue, rather than describing them. Once established, however, the mode has dominated the whole history of Western theatre, and subsequently film, television, and now interactive video gaming and other new media experiences. The essence of the dramatic mode is that characters in a story are directly impersonated (by actors), rather than being talked about by a narrator. Thus, drama is a mimetic art… Drama consists in the creation of a (fictional) tight-knit social group. The audience has the chance to directly observe social interaction, but also – usually – to be part of a conversation between the characters about what is going on within the group. The groups depicted, like real human social networks, typically consist of blood relatives, and coalitional cliques, and sometimes a few strangers. Characters have wants or objectives, and these belong ultimately to the set of basic motivations 1-5 above. Often those wants conflict with those of the other characters (and other wants of the same characters), and the work of the play is to resolve those conflicts. These characteristics already mean that dramatic presentations should have high attention-grabbing power for our evolved social cognitive mechanisms. Second, the content of the conflicts depicted is such as to make them especially attention-grabbing. 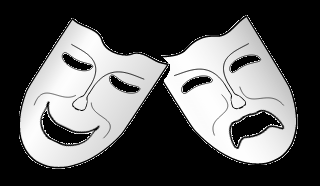 Right from classical times, dramas have mainly been discussed in terms of two categories: comedies and tragedies. These categories apply fairly accurately for most dramas for the entire intervening 2,500 years. Tragedies involve serious, often political, conflicts, usually leading to a negative outcome for the protagonist. Comedies typically involve conflicts that tend to the ridiculous and which are positively resolved. 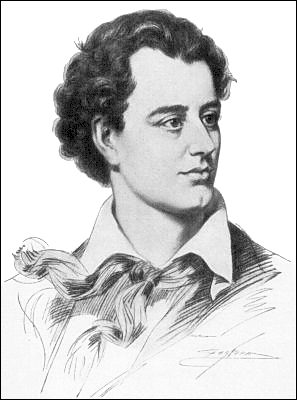 Thus, Byron’s heuristic (quoted above) separates the two classes reasonably well. If there is marriage after the final death, it is usually a comedy, and if a death after the final marriage, usually a tragedy. I will argue that tragedy and comedy quintessentially represent explorations of the domains of status competition (tragedy), and mate choice (comedy). Thus, they are the dramatic forms that fulfil feature (iv) above. Tragedies often end with a death because that is that is the extreme fitness change that can arise from status competition. Comedies often end with a marriage because that is the key fitness-change event that can arise from mate-choice procedures. (Nettle in Boyd, Carroll & Gottschall 2010, pp. 322-4) . 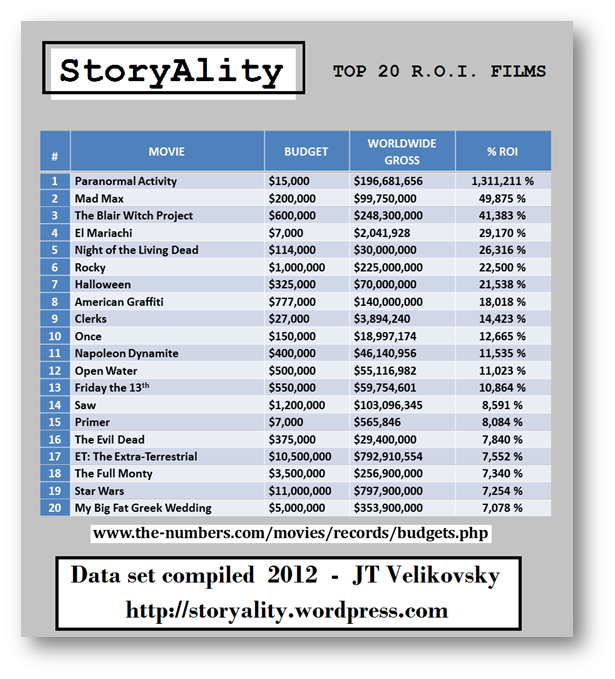 Okay so to test this (excellent) hypothesis of Nettle’s, how many of the Top 20 RoI films end in: a death? #9 – Clerks – not exactly, but – in the original Director’s cut, Dante is shot at the end. So, that’s 11 out of 20. And – we might also count #6 Rocky and #10 Once, as they are mating games that appear as if they will now end in marriage – even if we do not see the weddings. So, that’s 2 – and possibly 4 – out of 20. The only 3 films (of the top 20 RoI) remaining (that are not predominantly a mating game, and not a status game) are: Primer, The Full Monty and Star Wars. Although – these 3 films certainly have both mating games and status games in them. Well – so, that was an interesting and illuminating exercise. Nettle’s theory seems to be fairly well supported by evidence. `Shakespeare’s comedies all have essentially similar structures; a central set of potential couples (two in A Midsummer Night’s Dream and Much Ado About Nothing, four in Love’s Labour’s Lost, and so on) and related mating motivations, obstacles or confusions in the path of these, and structural transformations of the network which unblock the matrix of desire. The result is always a marriage, be it double, triple or quadruple. An interesting case, with regard to Richard III, and Star Wars, when we consider Anakin Skywalker/Darth Vader’s story, across all 6 Star Wars films. 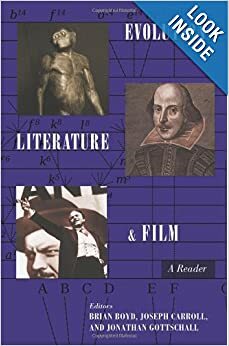 `The path of Richard III up, and then down, the status-fitness hierarchy is an exemplar of a clear model that runs through all of Shakespeare’s history plays, and many of the tragedies (indeed some of the comedies too, such as As You Like It and The Tempest). We have seen how the evolutionary principles expounded in general terms compellingly apply to a representative comedy and a tragedy [Twelfth Night and Richard III]. Comedy centrally concerns the procedure of pairing up sexually eligible individuals within a small group to everyone’s satisfaction. Its denouement is therefore marriage. Tragedy essentially involves competition for status within a social group; it may involve the attainment of dominance, perhaps temporarily, but its logical outcome is death. Both forms have high intrinsic attention-grabbing power because they are intensified conversations in the social domains that, because they affect our fitness most, we are most interested in. `There would seem to be four key types of dramatic plot. `As well as the question of whether the central fitness action is the mating game or status competition, there is the question of whether the ultimate change in fitness for the characters with whom the audience is most allied is positive or negative. Thus a mating game with positive fitness outcomes is a comedy, like Twelfth Night or Four Weddings And A Funeral, whereas a mating game with negative fitness outcomes is a love tragedy, like Romeo and Juliet or Hedda Gabler. A status game with a positive fitness outcome for the central character is heroic, like Die Hard or Henry V.
A status game with a negative fitness outcome is a tragedy, like Othello or Taxi Driver. The purpose of this paper has not been to argue that the dramatic mode, or comedy and tragedy, are in any way innate or direct products of our evolved psychology. They are social constructions with a particular historical origin and cultural history. Instead the argument has been that fictional representations must compete to garner human attention, and this influences the way that cultural traditions, drama in this case, evolve. It follows from what we know about the human mind that social information will have high attention-grabbing potential, and in particular information about how others in the social group around us are trying to maximize their fitness. So, let’s classify the top 20 RoI film into this matrix of Nettle’s. Although – Rocky, Napoleon Dynamite and El Mariachi could well also be classified primarily as a `Status’ game. And Paranormal Activity, Mad Max and The Evil Dead could also be classified as `Love Tragedy’. 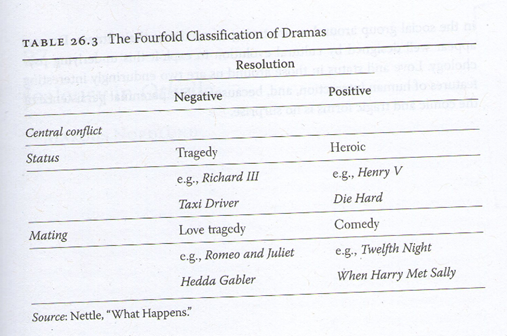 These 4 categories of Nettle’s Tragedy/Comedy matrix are obviously not: mutually-exclusive… For example, Taxi Driver could be regarded as a Love Tragedy, considering how Travis (De Niro) strikes out with Betsy (Cybill Shepherd). Paul Schrader (author of Taxi Driver) once characterized Travis Bickle’s character journey as: going after the woman he `wants but can’t have’ (Betsy) – to the woman `he can have, but doesn’t want’ (i.e. Iris the teenaged prostitute/Jodi Foster). At any rate – another fascinating exercise. Part 2 of Quotes from Daniel Nettle’s excellent chapter “The Wheel of Fire and the Mating Game” in Evolution, Literature, Film: A Reader (2010). A roomful of these guys, and a typewriter = ? Daniel Nettle, reprinted in Boyd, B., Carroll, J., & Gottschall, J. (2010). Evolution, Literature and Film: A Reader. New York: Columbia University Press.